The “compare” option has been expanded. You can now also compare fleets and galactic exploration %. Daily/weekly challenges now come with key rewards (just token rewards for now). Post here if you feel that the rewards are too little (or too much). A new type of challenge has been added: “Space Race”. On this challenge you are ranked based solely on how quickly you can finish a mission. There’s a time penalty for using special weapons. New challenges are issued every 3 days – the first challenge is scheduled for the end of Monday (at midnight). In other news, congratulations to all CIU recuits for surpassing 100,000 missions flown in total! “New contact request” message: Text paragraph is now spaced out correctly (line spacing was too tight). Mothership boss now reaches edges of screen before turning back. Added “galaxy exploration” stats on Profile screen. Added “victory ratio” to compare screen. Prevented Inbox ‘unread messages’ text from spilling outside red circle. Compare screen: now also compares fleets. Compare screen: now also compares galaxy exploration %. Information Overlay screen: player asterisks can now be hidden. Compare screen: Clicking on medals shows their description. Fixed galaxy showing names for newly relevant players even though the relevant Information Overlay option was disabled. 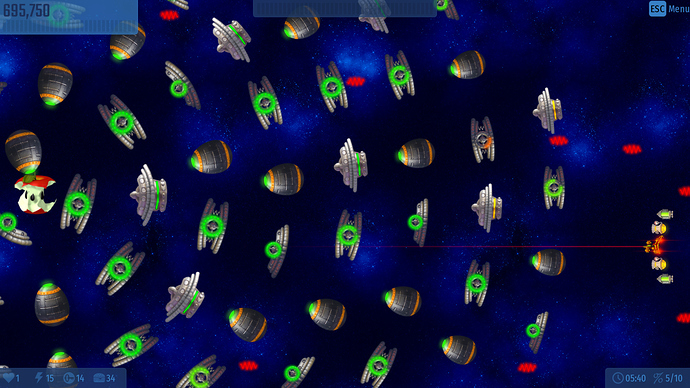 Planetary Egg City boss: beam attack now has random angle offset applied correctly (long-standing CI4 bug). Planetary Egg City boss: added mirrored variation. “Overheat” and “Coolant applied” messages now correctly rise when screen is zoomed out. Messages now support custom icon for better visual categorization. Added rewards for Daily/Weekly/Race challenges. Expanded information in “Top-10” messages. Added fullstop to “This trip can’t be interrupted right now” message. Shoot the Core boss: added mirrored variation. Each player can now only appear once in top-10 lists. Seems like the Space Race will encourage Tourist skill level usage, as it’s the easiest skill and it has a damage bonus (unless that’ll be penalized?). Skill isn’t currently penalized. It’s going to be tough to find a balance between how much skill needs to be penalized to make it fair. We’ll collect data over the following week and see. How many accounts have been created in total? When you play a mission again once you have already beaten it, you get less score. @InterAction_studios why were all messages deleted? So you will have to wait for Space Races! Muahahahaha! Atleast you got a daily stipend! and by the way @InterAction_studios is there somethik that i’ve done wrong that you remove me the regular status ? You can lose it if you don’t meet requirements. I have installed the update, but I haven’t really seen most of it, but everything sounds rather interesting. PS: How do I trigger a challenge? Also, how about making certain gear have a tier requirement for purchasing? For example, the best engine could have a tier 30 requirement, so this could make the cheaper gear a bit more usable. @GuestUniverse: A little over 3K. @theguyispALT: Technical reasons. Their format changed, and it’s easier to delete them than upgrade them to the new format. They’re ephemeral anyway. @gabytzu: We didn’t do anything, the forum software automatically adjusts levels based on participation over the last 100 days. If we understand it correctly, your account needs to give out 8 more likes to reach the ‘regular’ status. @ChickenInvader45: You can’t trigger them – challenges will arrive in your inbox when it’s time. @BoggY: Thanks! It’s a known issue, but fixing it is rather complex. It’s on our list.